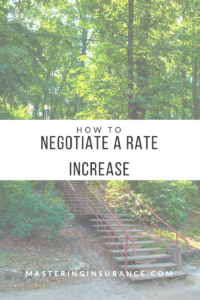 This questions comes up often: how do I negotiate a rate increase? When? I often hear fellow clinicians asking about how to negotiate a rate increase from an insurance company. I am always shocked when I hear that clinicians have never asked. That’s like working a job and never receiving a raise. Whether you accept insurance or not you should increase your fees and thus should request an increase in your reimbursement rate regularly. The first time you should negotiate rates is when you initially credential with a panel. When you complete the credentialing process you will receive a contract to sign and return so that it can be executed (activated). You should receive a fee reimbursement schedule along with your contract. Some panels are better than others at sending this schedule with the contract. Sometimes you must request it. Never sign a contract without first reviewing the rates. I immediately ask about negotiating the fees. I successfully receive an increase about 50% of the time, right out the gate. Some insurance companies have a mandatory waiting period, like one or two years before you can request an increase. You should find out their policy immediately. I set a reminder in my calendar and request an increase as soon as it is available. Generally, I request an increase each calendar year. Again, this varies. For some panels the person you start this discussion with is your provider rep. If you aren’t sure who handles this request, you can always contact provider relations. A good rule of thumb when contacting the insurance company for any reason, write down the date/time and name of the person you spoke with. I always write down the nature of the call (Credentialing for <Name of clinician>) and request a reference or case number for the call. Bonus: You should always bill your insurance company your full fee, even when you are in-network. Why? Billing insurance your full fee gives insurance companies an idea of the average costs of services in your area. This information is used when the panel determines when to increase reimbursement rates. We cover how to read and understand your contract, negotiate terms of the contract and include a sample rate increase template in the DIY Insurance 101 e-course. The Billing 101 e-course is also available. Registration for both courses is open NOW. Current rates go up TODAY! Oh, and CEU’s are now available through NBCC. Click here to check out the courses. If you aren’t in the Mastering Insurance Facebook group, you are missing out on a wealth of information from fellow clinicians on all things insurance. Join us and share your knowledge and experience! Previous Previous post: Insurance is recouping funds. What are my options? Next Next post: I am going from solo to group OR group to solo. Am I still credentialed?